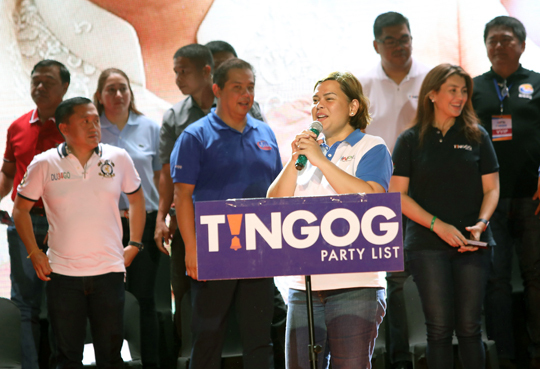 Tacloban City—Rising political kingmaker, Davao City Mayor Sara Duterte-Carpio on Tuesday declared that former Leyte 1st district Rep. Ferdinand Martin Romualdez would be the next Speaker of the House of Representatives in the coming 18th Congress. Prior to introducing the 13 senatorial candidates being backed by the Hugpong ng Pagbabago, the president’s daughter announced that Romualdez would be the next House Speaker. “The next Speaker of the House,” Carpio said, referring to Romualdez on two occasions during the HNP’s campaign caravan in the city held at the Tacloban Astrodome. Romualdez is a returning congressman in the province’s first district which he served for three terms— June 30, 2007 until June 30, 2016. He was succeeded by his wife, former Bb. International Yedda Marie Kittilstvedt- Romualdez, who is the first nominee of Tingog party list in the upcoming midterm elections in May. Romualdez is also the author of House Bill 1039, which was signed into law by President Benigno Aquino III as Republic Act No. 10754 or an act on expanding the benefits and privileges of people with disabilities. For his part, Romualdez, a lawyer and a banker, thanked the presidential daughter for the trust and confidence in him. “I was humbled by the mere mention of my name,” said Romualdez towards the end of the program before courting the votes of his constituents.